There are approximately 50 different species of Flying Squirrels found throughout the world. These animals have a wide range of colors and sizes depending on the particular species. 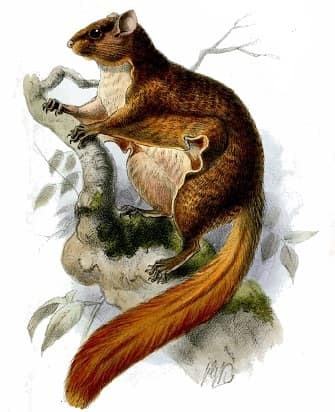 The Woolly Flying Squirrel is the largest while the Neotropical pygmy squirrel (Sciurillus pusillus) of South America is one of the smallest. They prefer to live in regions where there are forest areas. One interesting fact is that despite their name, they don't actually fly at all. The reason why they were named Flying Tree Squirrels may simply be because they appear to be flying when in fact they are really gliding from tree to tree. For more interesting facts about this amazing animal read below. This information is written for both kids and adults. Click here for a great selection of Amazon.com books about Flying Squirrels. The Neotropical pygmy squirrel is one of the smallest flying squirrel species in the world. This animals natural habitat is the rainforests found in the South American countries of Brazil, Peru, Colombia, Guyana, French Guiana, and Suriname. The longest recorded airborne glide for a Flying Squirrel is almost 90 meters (295 feet). Flying Squirrels are omnivorous and feed on various nuts such as peanuts, pecans, walnuts and hickory. They also eat acorns, wild mushrooms, bird eggs, insects and some flowers. Because of predators such as raccoons, birds of prey, cats, dogs, foxes and coyotes, the Flying Squirrel is nocturnal and forages for its food at night when its predators are asleep. Flying Squirrels are very vocal animals that produce both audible and inaudible sounds. A variety of squawks, chuckles and snorts are clearly audible to humans while some of their sounds are ultrasonic and cannot be heard. Flying Squirrels are mostly arboreal. They seldom come down from the trees. This plus the fact that they are nocturnal make it difficult for humans to observe Flying Squirrels. In the wild, Flying Squirrels live to be about 6 years old. In captivity they can live as long as 12 years. Because Flying Squirrels do not truly fly, they are not able to ascend. They will always land on lower branches than where they started. Flying Squirrels may nest together in large groups of up to 20 squirrels, in dens or holes of trees. Although they do not hibernate, they will congregate in close quarters to keep warm in the extreme cold. Anywhere from two and seven babies are born at a time. They are born hairless and blind but develop quickly. At one month old they can see and are no longer hairless. At two months they will attempt to glide by copying the mother. It is not easy to tell the females from the males as they look very similar. The Flying Squirrel has two important features that help them to see at night. They have bulging black eyes that have been adapted for better vision at night. They also have feelers, special whiskers that aid them in feeling around their surroundings at night. There is a furry membrane, called a paganism, between the front and back legs that the Flying Squirrel uses as a parachute when it glides. It is able to steer by using this membrane as a wing and adjusting it accordingly. The flat tail is used for balance on branches and stabilization when flying. If need be, it can also safely break-away from its body without any fatal consequences. Most species of Flying Squirrels range from 9 - 15 inches (22.86 - 38.1 centimeters) long.